On that day President Gamal Abdel Nasser, the leader who renamed a once and future Egypt as the United Arab Republic, made the decision to ask the United Nations to withdraw its peace keeping mission. We will never be able to assess his true reasons, but they are likely to have originated from the peculiarly Egyptian sin of seeking dignity at all costs. Shortly after the 1956 Suez Crisis, Nasser signed a memorandum with Dag Hammarskjold, then UN Secretary General, to de-militarize the Sinai and give the UN veto power over the withdrawal of its peace keepers. Nasser must have suffered this indignity only because the agreement was kept a secret. Anything less would have shattered the myth of the successful resistance to the Tripartite attack on Egypt. The Rotem Crisis of 1960 may have encouraged Nasser to think that the the memo has lost force and that there is room to give. The hot days of late May 1967 were a giant exercise in restoring his dignity, now tarnished by the costs of Yemen and poor economic planning. No one could pull him back from the brink, as any such effort amounted to an attack on his dignity, and by extension all of Egypt, which loved him for illusion of dignity he offered. The true disaster began to unfold four days later as Nasser tendered his resignation in a short speech on Television. For a few minutes some imagined an escape under Zakaria Mohieddin; a silent man whom many in Egypt believed to be friendly to the West and hostile to the failing economic policies of the preceding few years. But those who listened closely to the speech heard a father’s assumption of responsibility for the failures of his children; a profoundly damaging and cruel sentence to inflict on those who worshipped him, and those who loved him, even when they feared him. It was also an effective one, for crowds rushed into the streets to demand the immediate return of the “Ra’is”. There has never been an evidence of orchestration on the part of Nasser, and Egypt’s trajectory since that day provides plenty of evidence that the reaction may have been genuine. But a genuine reaction is far more troubling than a coerced one. And indeed, subsequent history would reproduce its lamentable features. We should note Rushdi Sa’id’s description of the 1967-1973 years as those of “Hope and Despair”. 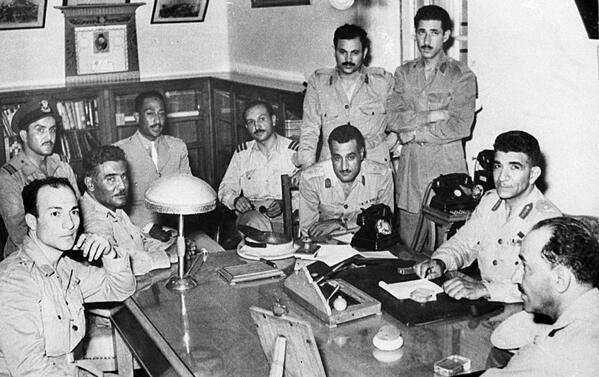 There were genuine openings and an attempt to bring the country together in a spirit of cooperation and “can-do”, but the presence of Nasser, and the “Free Officers”, at the helm meant that little of fundamental change could come to pass. The February revolution of 1968 was at attempt at genuine and liberal change, and it was snuffed out quickly by the wily Nasser who came to its aid as if he had not governed the country for 15 years. There were bound to be introspection on “what went wrong”. The first, and probably least known, was a panel talk in early July 1967 at Cairo University, organized outside official supervision and thus sparsely attended. A professor of Engineering (later forced to emigrate) boldly suggested that the defeat had two underpinnings. First, Israel had a more educated population, skilled in science and technology which are the tools of modern warfare. Second, it effectively mobilized its population because they were free to voice their views and believed in the goal for which they might give up their lives. The myth of “little Israel” had blotted out the reality that on June 5 Israel had a fraction of the population but more troops, armor and aircrafts than the combined forces of Syria, Jordan and Egypt. Both points were to make it to the official and social conscience, but in grotesquely corrupted forms. The official propaganda in Egypt began a campaign of promotion of “Science and Technology”, as a quick magic potion to overcome the defeat. But few were willing, even if able, to assert that science rested on the pursuit of truth, and to promote it, one had to rid Egyptian education of lies. In fact, the opposite came to pass. Commentators claimed that Science was an Arab contribution that the West has since appropriated and now it was time to claim it back in “authentic” form. The Israelis, understandably cocky, strutted on the world stage aided by admiring Western press. The psychic damage was severe, leading to a claim that the West had a fundamental aversion to Arab progress and an innate desire to keep the “East” under heel. This flammable discourse had existed since the 1920s and the days of the “Eastern League “in Egypt. (As an aside, the virus having acquired a systematic vector would eventually jump its host to settle in Western discourse of “post-colonialism”) This handicap meant that even the rise of impressively educated technical elite would not rid the country of habits of thinking that anchor authoritarianism deep into the social structure. A prime case is that of Dr. Mohammad Morsi, an American-educated rocket scientist, politician, and briefly a President of the Republic, who would issue bizarre and clearly incorrect speculations with a straight face. Nor is he an exception. Among his opponents there are many (in the acid words of an Egyptian scientist) “back-street obscurantists”. The second corruption was even more dangerous. The observation that in 1967 Israeli troops were more willing to die for their cause than the Arab troops was twisted horribly toward a culture of death rather than freedom. What the professor meant was that the average Israeli soldier was a citizen with a stake and a voice in his polity, while the Arab soldiers felt coerced, intimidated and ultimately not valued as either citizens or free men. The resurgence of political Islam post 1967 twisted this logic into building a desire to protect and die for Islam. It was but a short step to the grotesque and alien world of suicide vests and decapitation videos. Many will correctly try to link the setback of June 5 1967 to the current disasters in the Arab world. The hinge remains June 9 1967, when reality, having shone a light on profound deficiency, caused a retreat to the comfort of myths and repose of death within them.